Not Cover Under Arrive GuaranteedSemi-aggressive30 Gallon9.4 inchesYes, with CautionCarnivore, Live Shrimp, MeatyIndo-PacificScorpaenidaeSmall 1.5" - 2"
The Radiata Lionfish is not available in the shops as often as other lionfishes and because of this is more expensive and highly sought after by saltwater hobbyists. Radiata Lionfish are very similar looking to the Antennata Lionfish (Pterois antennata) but is distinguished by the horizontal lines on the caudal peduncle. Lionfish in general are usually fairly hardy but they do need excellent filtration and highly oxygenated water provided through the use of powerheads and airstones. Radiata Lionfish are nocturnal in the wild and like to hang out in caves and crevices so it's a good idea to try and replicate this in the home aquarium. Create a cave with the live rock in your tank to make them feel secure. Once they are acclimated to the tank and more comfortable with their surroundings they should come out more and hide less. You may have a difficult time getting your Radiata Lionfish to start eating. Entice them with live or frozen meaty foods (mysis shrimp, crab pieces). They will go after the smaller fish, shrimps and crabs in your system, so they are not considered reef tank safe. As you can tell, you need to be careful when selecting tank mates. Only house them with larger fish that will leave them alone. Triggers may pester them. Keeping multiple lionfish in the same tank can be done, provided that the tank is sufficiently large enough to accomodate multiples. 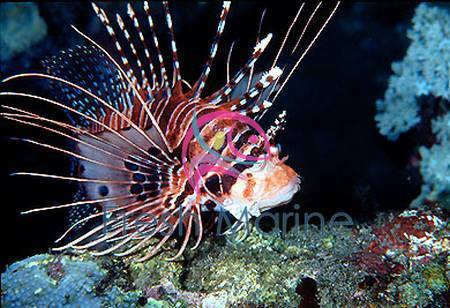 Use extreme caution when handling the Radiata Lionfish because the rays or spines are venomous. If you get stung you should seek medical attention. Don't mess around with this fish and please respect their spines! The Radiata Lionfish may act aggressively toward other fish. THIS FISH IS VENEMOUS. The pelvic, pectoral and dorsal fins of this fish can cause extreme pain. Severe reactions can occur if allergic. If stung soak injured area in hot water and seek medical attention. Radiata Lionfish can be kept in pairs in larger aquariums with excellent filtration and water quality. Maximum Size: This species grows to 10 inches in length. General Size: This Radiata lionfish is about seven inches in length. Minimum Tank Size Suggested: A 55 gallon or larger aquarium provides a good environment for these Radiata lionfish. Tank Conditions: The Radiata lionfish should ideally be kept in temperatures between 72 and 78 degrees Fahrenheit. A pH value of 8.1 or 8.4, and a specific gravity of 1.020 to 1.025 should be maintained. When kept with invertebrates, the specific gravity range should be 1.020 to 1.025, for the invertebrate species. In a fish only aquarium, the specific gravity should fall between 1.020 and 1.023. Habitat: The Radiata lionfish occurs on coral reefs in tropical marine waters of the Indo-Pacific. In Australia, the Radiata lionfish is known from central to north-western Western Australia and from the entire length of the Great Barrier Reef south to northern New South Wales and Indian ocean .